StreamHPC > StreamHPC communications > General > New training dates for OpenCL on CPUs and GPUs! New training dates for OpenCL on CPUs and GPUs! 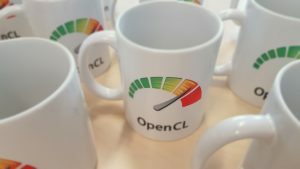 OpenCL remains to be a popular programming language for accelerators, from embedded to HPC. Good examples are consumer software and embedded devices. With Vulkan potentially getting OpenCL-support in the future, the supported devices will only increase. Minimum number of participants is two. By request the location and date can be changed. The first day of the training is the OpenCL Foundations training, which can be booked separately. For more information call us at +31854865760.